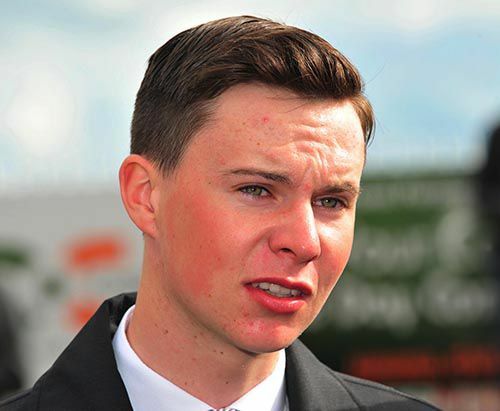 Fairyhouse Tue, 23rd Apr, 2019 Ivanovich Gorbatov They went quick and he enjoys that. He travels and he jumps very well. He probably got there a little bit sooner than ideal but he got a good jump at the last and that probably finished it for the rest of them. JJ gave him a great ride, he's been riding the horse and he knows him well. You have to take a chance, go down the inside, cover him up and have a go late. Things fell his way today, it's a lovely pot and I'm delighted for JP (McManus). He loves having cover, he loves good ground and a strong pace. When things fall his way he's a good horse and when things don't go his way he tends to sulk a little bit and he gives up. Thankfully today things went his way. He was working well but you don't know what you're going to get with him. JJ gave the horse a fantastic ride. He's strong as an Ox. He's a big help to us, he works every single day schooling and you name it. Obviously we get on very well. He knows how we like the horse ridden and he gets the job done. Leopardstown Sat, 6th Apr, 2019 Buckhurst He's a very nice horse. I was a little bit surprised that he won at a mile first time, off a slow pace,. Donnacha was very happy with him. I'd imagine we'll probably step into a Derby trial now and go from there. I was very impressed with him, the horse in front got the run of the race and there was strong word for a couple of others in the race. He's well bred, he's related to The Gurkha and obviously he's by Australia. Limerick Sun, 31st Mar, 2019 Star Max He had a disappointing run the last day in Cheltenham when we thought he'd run a bit better but he jumped well today and Rachael gave him a lovely ride,. He could go on for a Graded race at Fairyhouse next as we have nothing to lose and see how we go.